Please Just Kneel. Thank You. I have been to a couple of liturgies recently at which the congregation was to kneel. Inevitably, I end up behind the non-kneelers. They have either sat so that I have to lean back awkwardly or they have stood so as to make my view (and the view of all those behind them) one that rather distracts from the beauty and solemnity of the service. I am concerned that there is an assumption that one’s comfort or discomfort with the practice of the worshiping community should empower one to impair the experience of those further back in the congregation – those you share holy space and time with. I realize that standing through Communion has become the standard practice in many congregations. Yet, when one goes to another church home, it seems disrespectful to actively make a point of your discomfort or comfort. (Now, I absolutely realize that the kneelers at our parish can feel like you are engaging in an act of corporal mortification. If it is severe pain or physical difficulty that causes this then I absolutely understand). I am much more comfortable kneeling for Communion. There, I have laid my cards on the table! However, when I am in a congregation that is overwhelmingly standing, I now tend to stand along with them. This has certainly not always been my practice. In the past, I have been more than happy to hold the line for Holy Tradition and make a point to those whose practice I found disrespectful to the dignity of the Sacrament. Let’s call it adolescent grandiosity! Liturgy and prayer, however, are not the media for passive-aggressive ecclesial squabbling. It seems that part of catholicity is entering the space and time of the liturgy in the way that the Body around you is engaging the Holy. I do wonder, however, what it says about our culture that we have become so uncomfortable with kneeling in the presence of the Holy. To my mind, kneeling offers us a new way to lay aside our pride and, through the kinetic expression of our devotion, offer ourselves to the Presence. Many seem to equate kneeling with some kind of groveling and self-flagellation. It is thought antiquated and degrading. 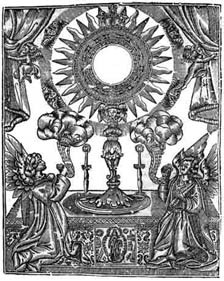 We even have a Eucharistic prayer that declares that we are “worthy to stand before you” as if kneeling implies unworthiness. To my reckoning, kneeling implies not our unworthiness, but acknowledges the deep and profound worthiness of God. In the presence of awe-filled mystery what can we do but fall to our knees and offer praise and thanks? “when Solomon had finished putting this prayer to the Lord and this plea, he stood up before the altar of the Lord, where he was kneeling, with palms stretched heavenward, and blessed the whole assembly of Israel “(1 King 8, 54-55). In the New Testament, Peter gets on his knees before Jesus (Lk 5, 8); when Jairus asked him to heal her daughter (Luke 8, 41), when the Samaritan returned to thank him, and when Mary the sister of Lazarus asked for the life of her brother (John 11, 32). The same attitude of prostration before the divine presence and is generally known in the Book of Revelation (Rev. 5, 8, 14 and 19, 4). S. John tells how he had seen and heard what was revealed and prostrated [himself] in adoration at the foot of the angel of God (Rev 22, 8). God says through Isaiah: “To me every knee shall bend” (Isa. 45:23). And S. Paul says, “for it is written: ‘As I live, says the Lord, every knee shall bend before me”‘ (Rom. 14:11). Again, S. Paul states “at Jesus’ name every knee must bend in the heavens, on the earth, and under the earth” (Phil. 2:10). Kneeling together testifies to our great thanksgiving for the mighty work of God among us. The Incarnation, Crucifixion, and Resurrection are acts of such divine mercy that our response can only be to fall down and give thanks for our creation, preservation, and all the blessings we share. Adoration and Repentance are at the heart of our love of God. Kneeling is a visible expression of our acknowledgment of that reality. Can I just say what a reduction to seek out someone who truly knows what theyre speaking about on the internet. You definitely know how one can bring a problem to mild and make it important. More individuals must learn this and perceive this side of the story. I cant consider youre no more standard since you definitely have the gift.